As a child, Christopher Carter never dreamed that one day, he would grow up to be a popular speaker and corporate entertainer in Chicago and around the world. Nor did he foresee spending his days and nights presenting unforgettable corporate entertainment to appreciative crowds in theatres, hotel ballrooms, convention centers and meeting rooms — evoking gasps, laughter and bursts of applause at sales meetings, trade shows, awards banquets and corporate events of every scale. 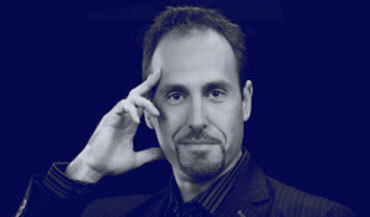 Now recognized as a leading corporate magician and mindreader, Christopher is the first to admit he’s not psychic. He’s simply an incredibly skilled observer of human behavior. As a college undergrad, he pursued dual interests in psychology and theatre. But it wasn’t until doing graduate work that he finally put it all together: blending his fast-paced, humorous theatrical style with stunning displays of psychological ability, to create the kind of thoroughly engaging corporate entertainment he’s known for today. Earning feature appearances on The Martin Short Show and The Donny and Marie Show, in which he amazed millions of viewers nationally. Being awarded by college programmers throughout the country with the Campus Activities industry’s highest honor — Entertainer of the Year. Being awarded the Dunninger Award by the Psychic Entertainers Association, recognizing him as one of the best mentalists in the world. Creating customized corporate entertainment presentations at the invitation of some of the nation’s top corporate groups, including Sprint PCS, Harley-Davidson, Bristol Myers Squibb, Phillips Electric, Wells Fargo, The Million Dollar Round Table, John Deere, Exxon Mobile, William Wrigley, and many more.